I recently got the Lodge grill due to my need for a grill. Your review was very handy in explaining what to expect (I ordered via Amazon). 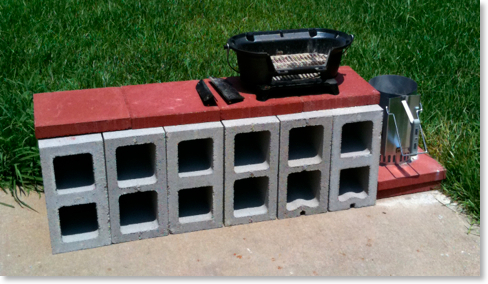 I even bought cinder blocks and tiles to create a very similar setup (see attached photo)! 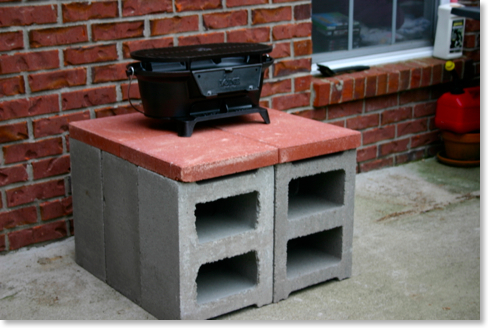 Here is the picture of John’s cinder block setup and mine for comparison below it. The LSG gets extremely hot, and it’s very important to have some kind of surface below it that cannot be damaged. If you place one of these grills on a wooden deck surface, it will definitely leave burn marks. Patio stones, cinder blocks, etc. provide good protection. Plus, it gets the grill off the ground which is easier on one’s back! John asked a few questions in his email which are in bold below, followed by my answers. I used it once and am trying to figure out how to clean the parts other than the grill top, which I cleaned inside. I will try the aluminum foil tip next time (I forget to line it before using). I read some guy used a shop vac. The shop vac is ideal. Small shop vacs are available that would be perfect even if only used for the LSG (assuming you grill enough to justify the purchase). When I clean mine, though, I remove the top grill and set it aside. Usually the fire grate still has coals on it, although these are really nothing more than ash themselves. I try to carefully pick this up to include as much of the ash as possible and pour this off into a trash bag (it’s very important to make sure none of the coals are still live!). Then, I take off the draft door and the fire door and simply turn the fire bowl over, dumping out any loose ash. I also keep a little brush inside one of the cinder block holes that I use to brush out extra ash. It’s really not a big deal if there’s a coating of ash remaining on the sides. As long as the grill is not getting wet, the ash is not going to harm the inside of the fire bowl. However, ash can be very corrosive on cast iron if it gets wet. Of course, keeping any cast iron item out of a wet environment should be assumed anyway. At the end of last summer, I gave the fire bowl a really good thorough cleaning with hot water and a scraper. Grease will build up and carbonize on the sides and in the bottom. This itself will not really hurt the grill, so I don’t worry about it during the summer months of prime grilling. At the end of this year, after two years of use, I may put the fire bowl in the oven and turn on the cleaning cycle. Afterwards, everything but the top grill can be repainted with black stovepipe paint to look as good as new. How do you light the coals? I used a chimney starter and transferred them over when they turned gray. But I realize that probably didn't give enough time for the cast grill to get hot enough. If you don’t use a chimney starter, the other obvious is charcoal lighter fluid. Some feel that lighter fluid can affect the taste of grilled food. This is definitely true if the lighter fluid is a cheaper brand. It may not be as true with some brands. Regardless, it’s worth the effort to experiment. Most folks like a chimney starter. When using one of these, after putting the coals on top of the fire grate, place the top grill in place and let it sit for at least ten minutes before placing anything on the grill. This should give it enough time to heat up. Any tips on the using the draft door? I always have the draft door slightly open to allow air to circulate underneath the coals. This allows them to stay very hot while cooking; but if the coals are too hot, I close the door to allow less oxygen to get to the coals. This is probably completely obvious, but the product descriptions say there are 2 adjustable levels. Do they mean you flip the top grill over (so the feet are sticking up)? Or is there some other way that I didn't notice to change the height? Yes, you’re exactly right. If the grill is turned over, it will be lower and closer to the coals. Honestly, I rarely do this because the grill gets so hot with the top grill turned up right. However, I’ve learned (the hard way) that when grilling round hot dogs, the lower setting keeps them from rolling off. However, you must use less charcoal if cooking something like hot dogs, brats, or even smoked sausages on the lower setting. I hope that helps some. I know that John is going to enjoy his grill. I am sold on the LSG, and will never purchase any other grill unless I simply get a second one to use beside the first one!